It may not feel like spring is in the air but Springtime has arrived with a floral thank you card. Spring is about new growth as the trees start to bud and flowers start to show their splendor. This is my favorite time of the year even as my allergies start to go wonky. So, join me in celebrating the arrival of spring with the Third Thursday Blog Hop. Florals are always popular and today’s card features the Needle & Thread Stamp Set which is unique as it features cross-stitch patterns. I wanted a quick card so I’ve used a classic layout to create a clean and simple, yet elegant Thank You Card. From a strip of the Needlepoint Nook Designer Series Paper and a small pop of Berry Burst card stock to the crisp Whisper White, I was able to create this card fairly quickly. I sometimes have a tendency to over think my designs. The ideas float around in my head and I love to experiment but new designs can take me hours to create. Meanwhile, I know sticking to a tried and true layout will get the job done. How about you? Do you have a tried and true layout that you love to use? As my style has evolved over the years, I find myself drawn to clean, crisp lines and especially a Whisper White card base. The Thick Whisper White is such an amazingly awesome product! It’s sturdy! I’m also a fan of using the Stampin’ Dimensionals to create multiple layers that “POP” and show depth. If there is one thing I can tell you and that I hope you’ll take away from this post is that you NOT be afraid to use multiple layers of Stampin’ Dimensionals on your projects. This thank you card easily features FOUR… Yes, 4 layers of Stampin’ Dimensionals! The card base is Thick Whisper White! Trimmed to 4 1/4″ x 11″ and scored at 5 1/2″. Adhere a 5 1/2″ by 1″ strip of the Needlepoint Nook Designer Series Paper to the left edge of the card base. I prefer using the Tombo Multipurpose glue so I can slide it around so it is up against the edge. I cut a card front measuring 3 1/2″ x 5 1/2″ and adhered a 5 1/2″ x 1/2″ strip of Berry Burst card stock to the backside of the Whisper White which is then adhered to the card base with Stampin’ Dimensionals. Stamp Large flower with Flirty Flamingo ink. I then stamped the leafy background with Old Olive Ink. Die cut each piece out using the Needlepoint Elements Framelits. I stamped the Thank You sentiment with Tranquil Tide and hand cut the strips. To the back of the leafy background, I added the Rose Metallic Thread then adhered to the card front with Stampin’ Dimensionals. Now, I adhered the flower to the leafy background with more Stampin’ Dimensionals. I’ve attached the sentiment to the flower using the Mini Stampin’ Dimensionals. Finally, I finish the card by adding some Share What You Love Artisan Pearls. To continue with the next blog on the Third Thursday Blog Hop, you’ll want to visit Kim Morris! I’m certain you’ll enjoy the projects she has to share with you! To view her blog, you can click on her name or on the Next Button below. The Humming Along Bundle is another stamp set along with coordinating framelits that I demonstrated at the Stampin’ Up! 30th Anniversary OnStage celebration. I love the hummingbird in this stamp set. Today’s Paper Craft Crew Sketch is perfect for the Humming Along stamp set. I honestly couldn’t decide at first between the hummingbird or flower but decided to go with the hummingbird as it’s a “non-traditional” approach to this sketch. My thought process is that a lot of people would gravitate towards floral type sets with this sketch. So, enjoy my Humming Along Thank You card and I invite you to play along with the Paper Craft Crew Challenge, click HERE! You’ll also find additional inspiration from the design team. The Challenge ends on Tuesday, March 26, 2019, at 1:00 PM EST. Do you enjoy heat embossing? I would love to hear if you do or don’t like heat embossing! The card base is Thick Whisper White measure 4 1/4″ x 11″ and scored at 5 1/2″. I adhered a 4 1/4″ x 1 1/2″ piece of the Tranquil Textures Designer Series Paper along the bottom edge. I’ve cut a 4 1/4″ x 4 1/2″ piece of Night of Navy then stamped with Versamark and heat embossed with White Stampin’ Emboss Powder. I adhered the Night of Navy with Stampin’ Dimensionals to the card base. The Heartfelt sentiment is stamped on Tranquil Tide cardstock with versamark and also heat embossed. Then, I stamped the Thanks on Mint Macaron with versamark and heat embossed again. I used the Banner Framelits to die cut the “Heartfelt” sentiment. The “Thanks” is die cut using the Stitched Labels Framelits. I’ve also die cut a small Gray Granite Stitched Circle. On the backside of the stitched circle, I added Silver Metallic Thread. Then I adhered the “Heartfelt” sentiment to the stitched circle with snail adhesive. I adhered the “Thanks” using Stampin’ Dimensionals and angled it slightly over the “Heartfelt” banner. The sentiment embellishment is now adhered to the card front using more Stampin’ Dimensionals. Finally, I finished the card by adding Basic Pearls. This week is a sketch challenge for Paper Craft Crew Challenge 330. I encourage you to play along and create a project inspired by the sketch. Remember, challenges are a fun way to help get your creative juices flowing. Whenever I’m struggling with my creativity, taking a look and following a sketch helps me immensely. So, I encourage you to play along with the challenge. Create a project then post to your blog or your social media venue of choice. Once posted, add the link to our InLinkz link provided on the Paper Craft Crew Challenge blog. To help you find additional inspiration, go visit the Paper Craft Crew blog. Check out the Design Team Samples. 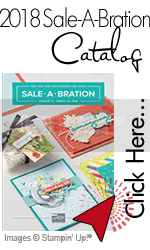 Less than 2 WEEKS to SHOP during Sale-A-Bration! Check out this video of the Craft & Carry Tote Bag as George shares a close-up look of all its features! For a close up look at the Craft & Carry Tote, check out this brochure. It’s a Happy Birthday celebration as I feature the Amazing Life Bundle! And, let me just say that during the month of March I take every opportunity to celebrate a very Happy Birthday. Last week I celebrated my 50th Birthday! I’ll be honest with you… I love to stretch birthday celebrations out for as long as possible. I’ve had an amazing life up to this point and I hope to continue that trend into the 2nd half-century! So, come along for the OSAT Blog Hop Birthday Celebration! I big shout out and Happy Birthday to everyone! We all have birthdays and while some of us love to celebrate them others prefer to just let them slip on by with very little notice. Let me just say that I LOVE to celebrate my birthday. My goal is to enjoy and live an Amazing Life (see what I did there!). And, so far… I have lived an amazing life. It’s not been a perfect life. There has been some heartache and sickness but there has also been lots of JOY. To me, an Amazing Life is about living for each day and celebrating the moments. On that note, let’s get to it and celebrate! Happy Birthday! The Amazing Life Bundle is one of the bundles that was my presentation stamp set for the Stampin’ Up! OnStage Live 30th Anniversary Celebration. Since Stampin’ Up! was celebrating a birthday and I’m also celebrating, I just had to use the Amazing Life Bundle. I love this set. It’s got a great mix of sayings and I love the Rectangle Stitched Dies that coordinates with the set. When I received the Amazing Life Bundle for my presentation, I flipped out in excitement. Then the magnitude of presenting in front of 6,000 PLUS demonstrators hit me like a brick wall! In the end, I think the presentation went well and I had a blast doing it. My card also features the Stampin’ Blends along with the Crackle Paint Background Stamp, Gingham Gala Adhesive-Backed Sequins and Gingham Gala DSP. I’ve colored the cake and letters to create an Ombre effect with the Stampin’ Blends. The background is stamped with the Crackle Paint Stamp which I sponged as I only wanted a partial background. Can you believe that I actually did some fussy cutting? Yes, I decided to fussy cut the little cake. I wanted it to sit at an angle overlapping the sentiment. The Lemon-Lime Twist Gingham Gala DSP was an afterthought by me. As I started assembling the card, the Gingham Gala DSP just jumped out at me. Adding the extra layer just makes the Cake and Sentiment pop. Oh, I also added a little bit of Polka Dot Tulle because I love it! Again, I’m using the Amazing Life Bundle to decorate the front of the mini bag I created. I’ve colored the cake again with the Stampin’ Blends using the Balmy Blue. This time, I used the Rectangle Stitched Framelits to cut out the cake. I also die cut a larger rectangle and embossed it using the Tufted 3D Dynamic Textured Impressions Embossing Folder. Little details add interest! I also die cut a circle using two circles to create a ring. The Gray Granite ring creates a unique detail behind the cake. I’ve also layered Silver Metalic Thread with the Silver Mini Sequin Trim. For the Happy Birthday, I used Gray Granite and the Rectangle Stitched Dies. The layers all came together in a cute “banner” that I attached to the front of the bag. Are you wondering how I created the bag? So, real quick, this is how I created the bag. The base starts with a 3″ x 5 1/2″ piece of cardstock. I scored 1″ around each edge then snipped the tabs and created the base of a box. Next, I took TWO sheets of the Balmy Blue Gingham Gala DSP and trimmed them each down one side so they measure 6″ x 5-3/4.” Along the narrow edge of the DSP, I scored 1″ on each sheet and folded it over. I then adhered one sheet of the DSP to the base using Tear & Tape. Along the outer perpendicular edges, I added more Tear & Tape. Now I adhered the second sheet to the other side and overlapped the edges of the other sheet where I had added the Tear & Tape. It really is a super cute mini-bag perfect for a small gift. To attach the handle, I punched holes on each side of the bag and used the Gray Granite Textured Weave Ribbon. To continue on with the next blog on the OSAT Blog Hop, you’ll want to visit Dena Rekow! I’m certain you’ll enjoy the projects she has to share with you! To view her blog, you can click on her name or on the OSAT Next Button.